“Don’t forget to look out the window” – good and useful advice, yet easy to forget in this age of technology. Probably the best reason to keep looking out the window, rather than at your instruments, is in order to see birds. Birds are much better at finding fish than us, a fact that’s not likely to surprise very many people reading this article. Even so, finding birds does not guarantee catching fish, with the intensity and type of event deciding which strategy is the most likely to result in a productive session. When fishing in an area of deepwater pinnacles known for kingfish, you notice a good numbers of gannets in the area, mostly sitting on the water, with a few in the air hunting. Every five minutes or so, the gannets begin diving intensely in a very isolated area. This almost certainly indicates that schools of predatory fish – probably kingfish – are working small baitfish balls to the surface and feeding hard until the bait disperses. This is a great opportunity to catch fish, but they can require a pretty specific technique. I enjoyed a great session with Spot-X Charters in the Bay of Islands a few years ago, while fishing off Cape Brett in an area adjacent to 71m Reef, and coming across exactly this sort of scenario. The technique employed involved having high-speed jig outfits set up and ready to go, while we waited and watched the gannets carefully for any indication of interest. (Classic signs were when they started to tightly circle or hovered over a spot looking down.) The skipper then quickly positioned the boat within easy casting distance of the hotspot, but not so close as to break up any bait ball. As soon as the gannets started to dive, we cast our jigs into the melee, allowing them to sink for 20-30 seconds before retrieving in the usual manner. Virtually every retrieve hooked a fish. The key to this technique was to be patient and be prepared to wait until the activity started. The feeding sessions were very short-lived and moved around in quite a random manner. If we were unable to move quickly to the spot because our gear was already in the water, we would miss our opportunity. While the fish on this occasion were not particularly large, it was an excellent morning’s sport. A large area of fluttering shearwaters is working in a poorly defined manner, more or less as an amorphous mass. The flock is flying and diving mostly in one direction, with birds repeatedly forming a leading edge that tends to dissipate as quickly as it forms. There are not normally many white birds – such as terns or red-billed gulls – associated with these events. This is a difficult scenario to fish successfully, yet there are almost certainly fish in the area, with kahawai often working the surface just in front of the diving petrels, along with snapper – but you’ll need to find them. This kind of work-up tends to take place in quite deep water of 40m or more. Patience and a good sounder should eventually locate the snapper close to the bottom, but not necessarily near the bird activity. The marks you see will often show as a patchy, thin blue line within a few metres of the bottom. Do not assume the snapper will be downwind of the birds; instead, they are likely to be down-current of the visible activity, which tends to be more difficult to determine. Be wary of dense colour marks on your sounder from mid-water to the surface, closely associated with the birds. These are often kahawai and barracouta rather than snapper. In the old days I favoured a heavily-weighted cut pilchard, well secured with one or two long-line hooks on monofilament (braid was too expensive). The reason for this was to get the bait to the bottom as quickly as possible (to avoid the barracouta) and then keep it in the right zone for as long as possible while the boat drifted. The long-line hooks made sense for two reasons. Firstly, they enabled any undersized fish to be easily released, and secondly, they helped to ensure a hook up even when the bites were difficult to detect. Since then, using braid instead of mono has provided two significant advantages in this scenario, allowing the bait to get to the bottom more quickly and providing vastly improved bite sensitivity. And while I still personally favour a cut bait for this situation, any number of products – such as soft plastics, pre-manufactured flasher rigs, or slow jigs – will almost certainly be just as effective. This scenario offers a great opportunity to experiment, and there will be plenty of time to change things around until something works. A mixture of seabirds – including gannets, fluttering shearwaters, red-billed gulls and sooty shearwaters – covers a large area of moderately deep water (30 to 60m, usually), which may also include some scattered dolphins. The activity may not be particularly intense, but the feeding activity appears to have been underway for a reasonable amount of time. The sounder shows patches of fish near the bottom reasonably consistently, but not in particularly dense concentrations. There is no defined bottom structure in the area. This is a classic Hauraki Gulf scenario at almost any time of year. The key is to get your bait or lure near the bottom and in the bite zone for as long as possible – much the same as scenario one. So, again, it is a good opportunity to experiment with various techniques, as you will probably have plenty of time to get results. However, although many other techniques will also be productive, I often opt for quite heavily weighted soft-plastics on braid, as these often turn out to be deadly in this situation. Unless it’s dead calm, it will be necessary to deploy a sea anchor to slow down the vessel’s drift. This will enable you to keep your bait in the strike zone for a prolonged period of time. 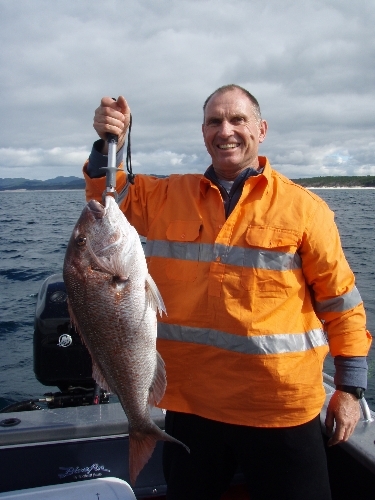 The predominant target species is likely to be snapper, but you can also expect john dory, tarakihi and possibly kingfish. Some people like to anchor up on fish marks they’ve located on the fish-finder, but I prefer to drift as I find the fish tend to move through. Red-billed gulls and terns are working a rocky outcrop or piece of structure that you may not normally associate with good fishing. This is a classic scenario that has produced some of my best and most entertaining sessions on snapper – sometimes fishing from a boat and occasionally from the shore. I have observed this scenario at unexpected locations around Cape Brett on numerous occasions, and have always been delighted with the results. Ideally the location is in shallower water of, say, five to 25m. If fishing from a boat, try to position the anchor in such a way so you can cast your baits or lures into the strike zone without disturbing the activity. The boat position is critical here, so take the time to get it perfect (see the summary notes for choosing an anchor point). And by setting up a steady berley trail, you’ll help to keep the activity going and hold it in your location. Drift lightly-weighted baits into the strike zone and wait for the action. A cast-and-retrieve action with soft-plastics should also produce great results. There will probably be numerous species present, including snapper, kahawai, trevally and kingfish. Koheru are likely to be around too, so set one out under a balloon, as this often produces a kingfish or even a trophy snapper. Finally, this sort of scenario is also a perfect opportunity for budding salt-fly anglers to learn/hone their techniques on kahawai and snapper. Fishing locations that are famous for bird activity. In Northland, the most famous of these locations are: the Karikari Peninsula; either the western end or the Teapot end of the Cavalli Islands; and from Cape Brett to Waiwiri Rock in the Bay of Islands. There are numerous other locations like these on the coast, and you will recognise them if possessing the following characteristic: the fish will usually only be at one end or the other of the structure, depending on which way the current is running. For example the western end of the Cavallis and the Teapot end of the Cavallis are at opposite ends, and separated by about 1.5 nautical miles of smaller islands. If the current is running down the coast, the birds and the fish tend to be at the western end. However, if the current is running up the coast, the activity is at the Teapot end. This is an oversimplification, but the point is, fish the end that has the birds in attendance, because this is where the fish will be. From a practical point of view, if you head out to the Cape Brett Peninsula and arrive at the Hole in the Rock to find no bird activity present, take the time to head round the corner to Waiwiri Rock, because the activity may well be focused there due to the nature of the current that day. This is not to say you won’t catch fish where there are no birds; it just means it’s usually worth an extra 10 to 15 minutes to help ensure you’re fishing the optimum location that day. • The presence of birds is always a good thing. • Take the time to observe the behaviour of the various species present before committing yourself by putting down the anchor. 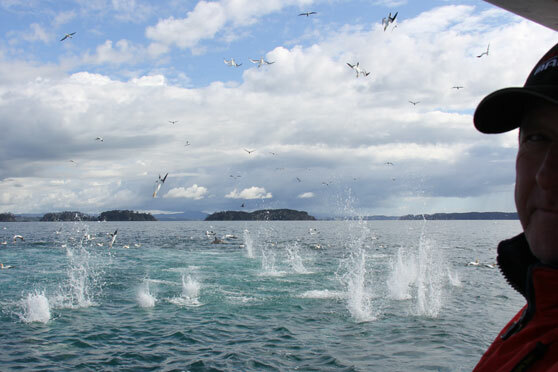 • Intense bird activity that starts and stops rapidly and moves about in a random fashion is likely to indicate the presence of large predators such as kingfish. To get the best results, you need to be ‘Johnny on the spot’, so consider waiting, jigs ready, for the activity to begin. • Less intense activity over a wide area will produce fish, but you’ll need to use your fish-finder and some patience to get the most out of the opportunity. Fish the bottom on the drift if possible. • Activity associated with structure requires good boat positioning and normally needs to be fished at anchor. Take the time to clearly understand which way your boat will sit at anchor before placing it. The easiest way to achieve this is to drift the boat before anchoring, taking note of the drift direction on your chart plotter. 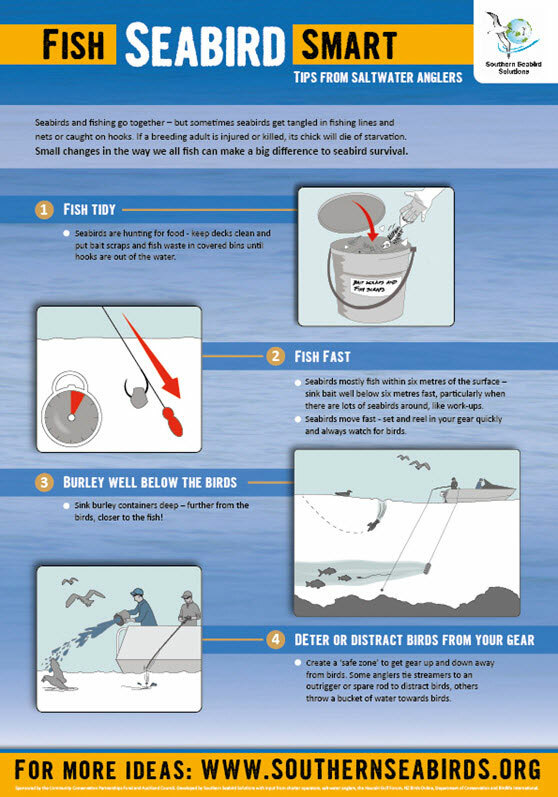 These scenarios will produce a wide variety of fishing-method opportunities. • If there are multiple bird species present, including fluttering shearwaters, red-billed gulls and terns, pay more attention to the terns and red-billed gulls, as they tend to be associated with the more productive activity. • When fishing structure, a berley trail helps keep the activity’s momentum going. • When fishing deep water, use a sea anchor to slow down the boat’s drift and use adequately weighted baits on braided lines so they stay in the strike zone for as long as possible. The following pointers come courtesy of Graeme Taylor at the Department of Conservation. • All seabirds should be handled with care. The best approach is to handle them firmly enough to prevent struggling, but not so hard as to do damage. Bird bones break much more easily than those of other animals. • Wear gloves to protect yourself and ensure any towel or item of clothing used to help restrain the bird is clean from oils or detergents, as these can easily damage the bird’s natural wax coating. Make sure the general environment you are handling the bird in is also free of oils or grease. • Hold the back of the neck firmly to get the head under control, then slide your hand in from behind the head to the base of the bill. Birds can breathe through their nostrils, so holding their mouth shut will not prevent them from breathing. Keep their bodies pressed to the ground firmly enough to restrain their feet, as their claws can do some damage. • Fold the wings against the bird’s body in the natural position to prevent damage. 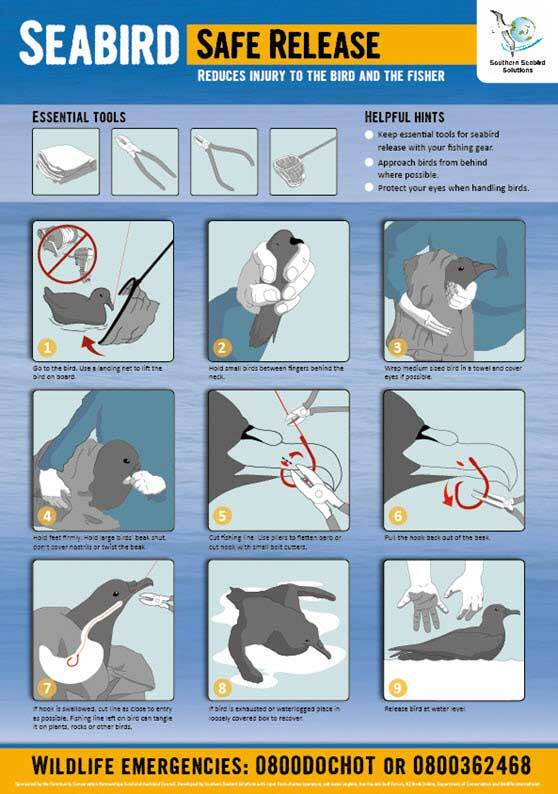 • If the hook is embedded in the bird, attempt to remove the barb before extracting the hook. If you cannot remove the hook without doing damage to the bird, particularly internal damage, cut the nylon is short as possible and let nature take its course. • If the process of freeing the bird takes too long and the bird is showing signs of stress, such as gasping or panting, put the bird in a dark, quiet and cool place for a period of time to relax it. • Protect yourself from the bird. Larger birds, like albatrosses, can injure with their hooked beak or claws. Be sure to take the steps above to immobilise the bird. • Gannets are capable of injuring you by hitting your face with a snakelike strike. They may be sitting completely still and surprise you, so take care. New Zealand Bird Rescue is a charitable trust. They will be happy to help if you either have caught a bird that appears to need further assistance or have found a sick bird at sea. The website is www.birdrescue.org.nz. The contact number for Auckland city is 09 570 4750.